The training focuses on the fundamental principles concerning the behaviour of mechanisms and how this behaviour can be predicted and improved. 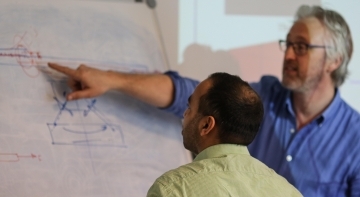 The learning goal is that after the training the participants are able to recognise, identify and evaluate the fundamental aspects concerning the behaviour of mechanical designs. This course is intended for all engineers involved in mechanical, mechatronic and system design who want to be able to recognise and analyse mechanisms with a predictable and reproductive behaviour. It is recommended that participants already have a Bachelor or Master education in mechanical engineering, mechatronics, physics, or equivalent practical experience. The training material originally has been developed by Prof. Ir. W. van der Hoek (Philips and TU Eindhoven from 1962 till 1984) and Prof. Dr. Ir. M.R. Koster (Philips, TU Eindhoven and TU Twente from 1984 till 2008). During the course many hand models are presented helping to explain the fundamental theory behind the subjects. It was Prof. Ir. W.van der Hoek who started to build an approach for designing mechanisms in such a way that the behaviour of these mechanisms could be predicted without the need for complex calculations. He developed and taught this approach at the Centre For Technology of the Philips Company and at the Mechanical Engineering Department of the Technical University of Eindhoven and succeeded in inspiring a whole generation of mechanical engineers. It has been and still is our intention to achieve continuity in the training of engineers in this approach. There is no formal exam and consequently the participants receive a certificate of participation. The training is set up as a workshop with exercises during which the participants can show whether they master the concepts or whether some additional explanation is required.